Converts Base64 files to binary, and vice versa. Is there a better alternative to Convert64? Is Convert64 really the best app in Compression category? Will Convert64 work good on macOS 10.13.4? Convert64 helps users convert Base64 files to binary and vice versa. 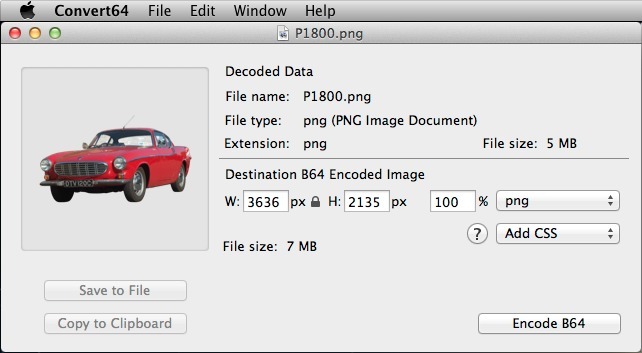 It also helps users figure out the file type of a file that is missing its extension. Convert64 can also wrap your base64 encoded data in CSS or HTML. Convert64 will even estimate the final size of the base64 encoded data before you start the conversion process. Convert64 needs a rating. Be the first to rate this app and get the discussion started!